NYR Children's Collection, 9781681372457, 48pp. 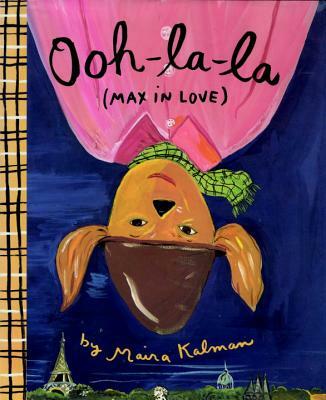 Max the dog-poet is back, this time in Paris and falling in love, in Maira Kalman's delightful picture book. It's happened. Before you can say "Pepe le Pew," Max the millionaire poet dog has landed in Paris, the city of lights. The city of dreams. Everyone is in a froufrou of delight over Max. There's Fritz from the Ritz, Madame Camembert, Charlotte Russe, and Pierre Potpurri, who wants Max to perform in his Crazy Wolf Nightclub. Amidst the enchantment and beauty that is Paris in the spring, something is missing for Max. Max has made his millions; when will he find romance? Maira Kalman is an illustrator, author, and designer. She has created many covers for The New Yorker, including the famous map of Newyorkistan (created with Rick Meyerowitz). Kalman is the author of twelve children's books, including five books about Max the dog, which will be reissued by The New York Review Children's Collection: Hey Willy, See the Pyramids and Max Makes a Million (September 2017); Ooh-la-la (Max in Love) and Max in Hollywood, Baby (February 2018); and Swami on Rye (September 2018).She also has designed fabric for Isaac Mizrahi, accessories for Kate Spade, sets for the Mark Morris Dance Company, and, with her late husband Tibor Kalman under the M&Co. label, clocks, umbrellas, and other accessories for the Museum of Modern Art. Ms. Kalman's work is shown at the Julie Saul Gallery in Manhattan.